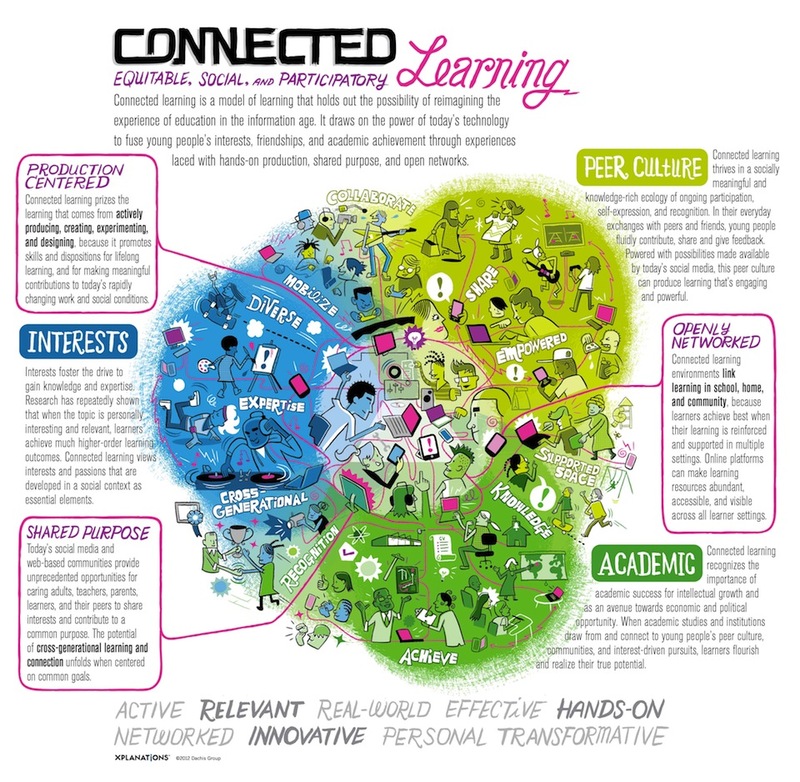 We, as educators, are in the midst of a "Crisis of Learning Contexts" - Traditional Learning Context (familiar to politicians, parents, teachers, and communities) vs. Modern Learning Context (connected learning via the web) Connected technology is here to stay! The challenge is to adequately prepare students for modern, contemporary, connected learning. "Internet of Things" - stuff (appliances, accessories, clothing) will become web connected. Examples: +Project Glass and Twine. Living knowledge, Constant Learning - today's students need to learn to live in the "information flow". Workers need to be "nimble" and prepare for the fluidity of work and learning experiences. If people need to learn - they should "go learn". It is the individual's responsibility to stay current and to keep learning. A good goal for our students - become "Googled-Well" under their full names by high school graduation. Create a positive digital footprint. An online resume of your professional / educational accomplishments or "learnings". Publish authentic solutions to authentic problems for authentic audiences. MORE - engagement, opportunity, intensity, pressure. More paths to solutions - the traditional path no longer exists. Personalized learning is different that Personal learning (the learner chooses) - Ten Tips for Personalized Learning - +Edudemic Gaming and gamification of learning will become huge - while traditional grading and standardized tests are likely to disappear. In the future, bi-lingual will mean language (English) + programming language. What do students need to learn in school during a time when they can learn so much without educators? In a world of abundance, what do students really need to know? What is the value of school during a time when we don't need school to do school? That which cannot be "Khanified" is what needs to be learned in school. Real work for real audiences. Create dispositions for students - self-regulated, persistent learners wanting to learn more. Learners first - teachers second +Jay Cross. Adults need to learn and use technology well - become models for students. NY Times - "Snowfall" - example of digital storytelling, engaging / interactive text - Students need to learn to read and to create multi-media texts.